WASHINGTON -- The attorneys general of Maryland and the District of Columbia have announced they've filed suit against President Donald Trump, alleging he violated the Constitution by retaining ties to a sprawling global business empire. 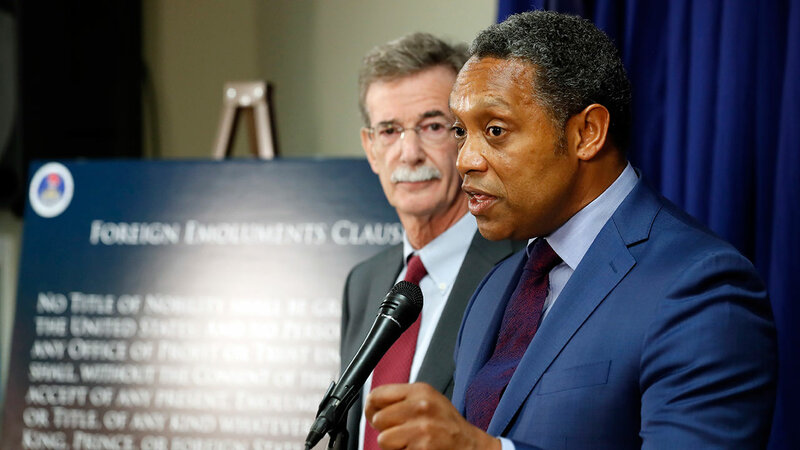 District of Columbia Attorney General Karl Racine and Maryland Attorney General Brian Frosh made the announcement at a jointly held news conference in Washington, confirming the suit has been filed in a court in Maryland. Frosh and Racine cited Trump's leases, properties and other business "entanglements" around the world as the reason for the suit, saying those posed a conflict of interest under a clause of the Constitution. "The presidents' conflicts of interest threaten our democracy," Frosh told journalists. "We cannot treat the president's ongoing violations of the Constitution and his disregard of the rights of the American people as the new acceptable status quo." Racine says the president has spoken about drawing a line between the presidency and his many businesses and properties but that he "has walked his promise back." "We have a duty to enforce the law and that's why we are taking action today," Racine added. The White House did not immediately respond to requests for comment Monday. The president called an earlier, similar lawsuit about the so-called emoluments clause of the Constitution an issue "without merit, totally without merit."